Emma Watson Gets Kids Excited About Hockey in London! | Emma Watson | Just Jared Jr.
Emma Watson Gets Kids Excited About Hockey in London! Emma Watson is a former hockey player and she’s doing her part to get schoolchildren excited about the sport ahead of the Vitality Hockey Women’s World Cup. The 28-year-old actress visited a school in East London with some of England Hockey’s female athletes as part of the launch event for the new charity Hockey Futures. “Hockey was a big part of my life growing up and I’m thrilled that England Hockey are committed to making the sport more accessible to children all over the country through the launch of Hockey Futures. Hockey is the nation’s most gender equal sport and it was fantastic to visit a Hockey Futures session at Thorpe Hall primary school and see children playing together, learning new skills – and teaching me some new hockey tricks too!” Emma said in a statement. Emma played hockey as a youngster and also as a student at Brown University! Emma Watson & Tech CEO Brendan Wallace Share a Smooch Over Lunch! 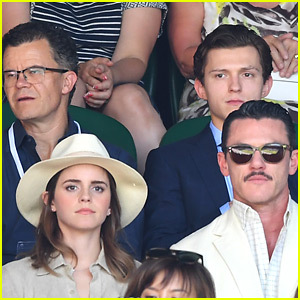 Emma Watson & Luke Evans Meet Up with Tom Holland at Wimbledon! Emma Watson & Joe Alwyn Look Sharp at Wimbledon 2018!